Which is better for functional ware? Cone 04? Cone 10 reduction? Not so fast! Cone 10R ware is only strong if the glaze fits. Fortunately this does. But either one will break if dropped on the floor. The stoneware clay has a porosity of 2.5-3%, the earthenware 12%. 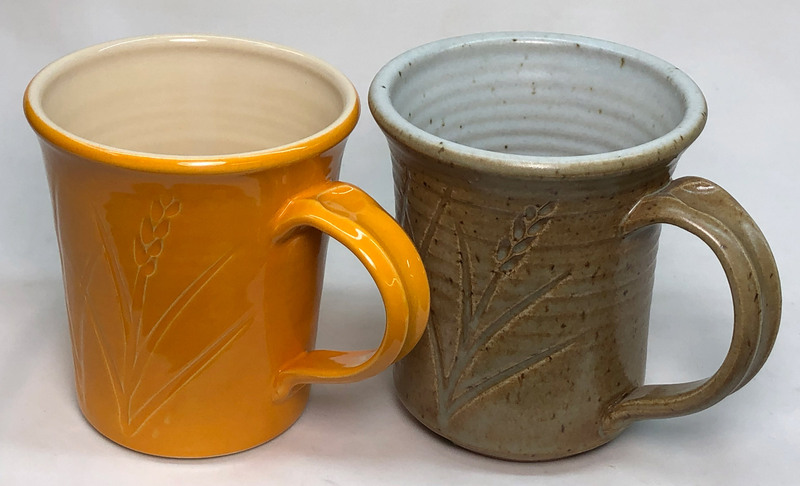 But the entire base of the orange one is glazed (it was fired on a three-pointed stilt), and the glaze fits well, so there is no point-of-entry for water. The stoneware mug has bare clay exposed on the foot so it will absorb some water. The stoneware mug weighs 432g, the other 281g. It holds only 1.16 times its weight in water, the orange one 1.92! The earthenware is a much better thrower. It is also a much better insulator, you can hold your hand around it with scalding hot coffee inside. And only two pint jars and a brush were needed to glaze it. And it fired in four hours. I needed to make two pails of glaze for the other and took 22 hours to fire! My favourite to use right now: The orange one. Incredible mother nature’s porcelain, Functional ware at low fire! Don't dismiss it just yet.